The Web Designer diploma program provides students with the necessary skills and knowledge to build a Web Design foundation, learn industry-standard software programs, and produce a well rounded and exciting portfolio. 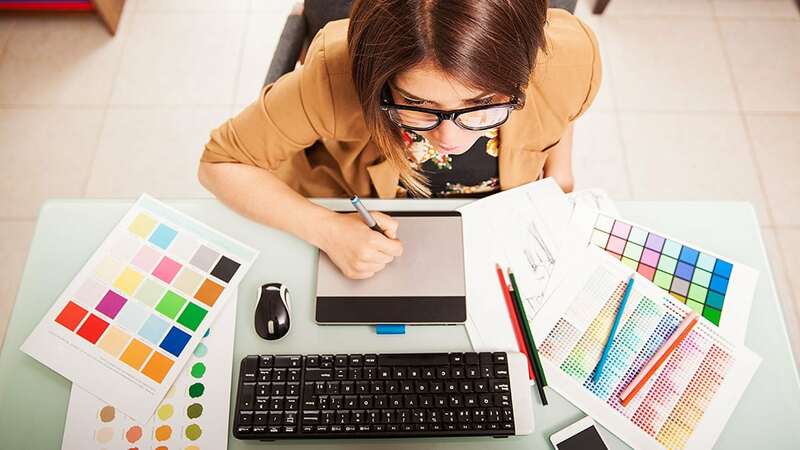 Students learn how to plan and design compelling and interactive websites and learn to use industry-related programs such as Adobe Photoshop, Illustrator, Dreamweaver, and Flash for website designs. Students will also explore HTML and CSS for Web publishing, alongside essential topics such as accessibility standards, color, typography, composition. Web Design graduates develop a professional design process for building a Web site, from concept to launch. The Color Theory course focuses on developing appropriate color systems for graphic design projects. These projects explore the principles, terminology, and applications of color theory, with an emphasis on manipulating color. Students will acquire a working knowledge of the expression and perception of color, and color interaction, which lends credibility and sophistication to a designer’s work. Web Portfolio Design course provides students with the opportunity to build an online portfolio for future employers and clients. Students learn how to identify their strengths and weaknesses as a designer and select works that best showcase their talents. This course consists of three lessons. Each lesson is divided into a lecture and an exercise. This Photoshop Basics course starts you off with the basics of the Photoshop interface and quickly gets you working on hands-on projects based on real-world design scenarios. You’ll learn to choose and use the best techniques for common Photoshop jobs including selecting and isolating objects, creating image composites, masking and vignetting images, setting typography, and improving images with retouching and effects. In this course, students learn how to make high-quality selections and edits, and develop an efficient imaging workflow. In the Fundamentals of Typography course, you’ll explore the anatomy of the letterform. Through interactive lectures and hands-on exercises, you’ll learn how to classify typefaces and use them creatively. Understanding the fundamentals of typography will give your work power, eloquence, and beauty. In the Illustrator Basics course, you’ll build a solid foundation in Adobe Illustrator, learning from a master teacher. You’ll start with a tour of important menus, tools, and panels, then explore selection tools, drawing tools, layers, the Pen tool (a lesson unto itself) as well as transformations/distortions, type tools, and modifying paths and shapes. In the Web 101 course, students explore a wide variety of Web-based terms and technologies, including Web 2.0, social networking, blogging, domain names, and more, picking up concepts they need to know in making today’s Web technologies more interactive. Students explore the technical fundamentals of editing and uploading Web pages and gain an insight into online marketing and search engine optimization. By the end of the course, students will have launched a Web site and gained a basic grasp of how to use Web tools to make your content more interactive and reach your site’s target audience. Introduction to Web Design course provides students with the skills required to recognize and describe the fundamental aspects of Web page design. The course emphasizes a range of important factors in any Web design from identifying a site’s target market to describing interactive features, and noting the use of animation and multimedia. Through critical exposure, students analyze a variety of sites, and develop their own Web design language skills. In the Web Design 1 course, you’ll learn a systematic professional approach to Web design. You’ll use site maps, wireframes, HTML/CSS layouts, comps, color palettes, usability tests, and other tools and concepts to make sure your designs hit the mark. Students are expected to have a basic competence in HTML/CSS design, Photoshop or Fireworks, and Dreamweaver. Building upon those skills, students will complete four portfolio projects that challenge their Web design skills and build an understanding of how to manage Web design projects in a professional context. In the WordPress Development course students learn how to develop Web sites that take advantage of the power, versatility, and community of WordPress. Students start with the basics of WordPress navigation and interface, then they open the hood, learning the anatomy of WordPress themes and how to make their own. Students also explore child themes, functions, hooks, filters, plugins, widgets, custom post types, and more, all with one big goal in mind: learning the techniques and tools essential to developing excellent WordPress sites. In the Information Design 1 course, you’ll learn systematic techniques for each stage of the Web site design process. You’ll learn how user demographics, competitive critiques, feature lists, site maps, and wireframes are used in information design. In the HTML and CSS Essentials course, you’ll begin by mastering the basics of HTML markup and how to structure HTML5 pages. You’ll also learn how to create HTML tables and add multimedia with HTML5. Then you’ll learn to translate your page structure into visual designs that use CSS for typography and positioning. The course wraps up with a look at Web forms, CSS-based navigation, and special CSS3 visual effects. Dreamweaver 1 course helps students develop practical skills for the HTML editor of choice for professional Web designers. Dreamweaver combines a host of Web design tools in one easy-to-use application. Without any advanced HTML knowledge, students learn to design sites by creating advanced layouts using CSS to manipulating colors, typography, and page layout. Dreamweaver 2 teaches students powerful features that lie just below the surface in Dreamweaver, including precision layouts through Cascading Style Sheets, templates and asset management, and even the ability to create high-end interactive features without wading through reams of code. Each hands-on lesson and exercise combines upper-level Dreamweaver technology with visual Web design know-how. ; design and build a MySQL database and write basic SQL queries; write basic PHP scripts to collect and process information from forms, troubleshoot and fix common PHP scripting errors; write scripts to store information in a database; and display dynamic information on multiple pages within a site. In the Flash Basics course, you’ll develop a deep understanding for basic drawing and animating tools in Flash, mastering such critical elements as layers, symbols, and tweens. You’ll build interactivity into your designs using advanced animation techniques, 3D rotation, navigation buttons, video, and even basic ActionScript. In the Personal Computer Fundamentals for Technical Users course, students learn about the components and basic operation of the personal computer. The content in this course is both conceptual and practical, and is intended to provide students with a working knowledge of computing. Students explore hardware troubleshooting, file management, multimedia options, and browsing the Internet. This course will also help students assess and decide what type of computer is appropriate for their needs. The Marketing and Sales course introduces students to the theory and application of modern Canadian marketing concepts, principles, and techniques, and examines the importance of marketing in society as well as within a company. With the objective of learning how to develop a comprehensive marketing strategy and creating loyal customers, the major components of the marketing mix are studied. The role of marketing is explored at the local, national, and international level. Both the final consumer and the business customer are considered. nt. The hard skills students will develop and apply include setting goals and objectives, preparing meeting checklists, and developing strategies.